The NCAA football powers that be have had one of those weeks. You know those weeks where literally everything you do just turns to feces in your hand. And not the kind that’s easily disposed of. More like the remnants of Jager bombs, LaBamba’s Super Nachos, a couple Chicago dogs, and about 15 PBRs. That’s the week the NCAA was having. They apparently were not content with their doo doo mess to this point of bowl eligibility and sticking it to the midmajors, and have now put the icing on their poocake with the assassination of fun had in NCAA football on all levels. When you read the press releases about the latest order of business undertaken at the Playing Rules Oversight Panel’s meetings for the 2011 season, the overarching theme will be the elimination of the wedge block on kickoffs. That’s what they will champion, because it apparently stops concussions. And who likes those? So the NCAA will sit back and collectively pat their own backs for their swift justice against those dastardly concussion monsters. What will be swept under the rug from the mainstream media, especially those suckling at the NCAA power teet like the ESPNs of the world, is the other two rulings… which are pretty major, at least in the minds of this humble blogger, and pretty much every other blogger worth his weight in Cheetos and Mountain Dew, since that’s what we consume in our parents’ basement while trying to defeat this interwebs. In 2011, you can forget about seeing Bible verses or area codes under your favorite player’s eyes emblazoned in that fake eye black glare reducer which reduces absolutely zero glare. Granted, it had become a fashion statement more than a vision savior, but is it truly that big of a deal? So the player who isn’t paid for their services, body, or effort doesn’t even have the ability to express themselves in any way shape or form? And this was on the mind of the Panel? Not BCS equity. Not cracking the whip on recruiting violations. Not trying to make college football more economical. Nothing like that comes close to the pandemic sweeping through the sports landscape like eye black and the logos or numbers written on it. Did I miss something? Was someone offended? 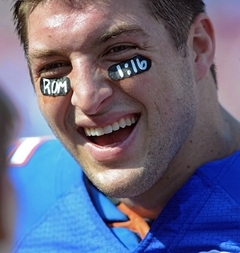 Did someone write profanity on their eye black? I’m pretty sure I’ve seen everything from school logos, to favorite biblical verses, to area codes. And I’m also pretty sure I couldn’t care less what someone has written on their eyes. Under their helmets. Which they almost always have on. Yes… clearly that is a good use of time, NCAA. Congratulations. What’s that? You have more rules changes to expunge this so called “fun” and “excitement” out of these athletes? Fabulous! Currently, should a player taunt, ridicule, or otherwise draw attention to themselves, a 15-yard penalty is enforced on the conversion attempt or the kickoff. However, the score stands. Not anymore. Beginning in 2011, live-ball penalties will be assessed from the spot of the foul and eliminate the score. This makes total and complete sense. I mean, hell, if the student athletes on the field can’t be trusted with eye black, we certainly shouldn’t leave the outcome of the game up to them. Let’s leave it in the hands of officials who can basically make judgment calls to disallow touchdowns. I’m sure there will be nothing that ever happens with this sort of power that will further reduce the fan’s faith in officials at the college level. Nope. Never. Sigh. One thing I do find ironic is one of the more vocal supporters of this measure was Indiana coach Bill Lynch. Readers of this blog will remember Lynch as the former coach of our beloved Ball State Cardinals. Lynch made this statement after the taunting rule was unveiled: “Just run it into the end zone, how hard is that?” Well, Bill, after watching your teams lose 21 straight games as well as the pantsings we took at pretty much every major school we played, I’d say it’s hard. Damn hard. However, let us be clear that Lynch’s support is only one of the many reasons why this change in rule is awful. Ironic, your table is ready.